(Center for Basque Studies Conference Papers) University of Nevada, Reno, 2005. Anna Maria Guasch and Joseba Zulaika, editors. Hailed as an “Instant landmark,” Frank Gehry’s Bilbao Guggenheim brought a new sense of relevance to architecture in the transformation of urban landscapes. Gehry’s optimistic artichoke set amid Bilbao’s postindustrial ruins has become an icon of what architecture can do for a city decline. As a result, every city has dreamed of its own Guggenheim. 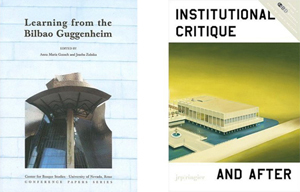 Eleven years have already passed since the momentous apparition and the time seems ripe to reflect critically on the influence of the Guggenheim on the world of art, architecture, museums, and urban renewal. What can we learn from the Guggenheim effect? Contributors: Beatriz Colomina, Lucy Lippard, Ery Camera, Jeremy Gilbert-Rolfe, Allan Sekula, Anna Maria Guasch, John C Welchman, Joseba Zulaika, Andrea Fraser, Jon Azua, Javier Viar, Hans Haacke, Muntadas, Dean MacCannell, Keith Moxey. RP|Ringier, 2006, John C. Welchman, editor. The anthology explores the history and contemporary reassessment of Institutional Critique, launched (but not yet so-named) in the late 1960s by artists including Marcel Broodthaers and Daniel Buren in Europe and Michael Asher and Hans Haacke in the US. In the aftermath of a movement that commenced nearly four decades ago, how have its leading concepts, assumptions, and tactics developed, especially as many of them can no longer be considered as radical or adversarial as they might have been in the late 1960s? Have the demographics and cultural politics of the museum and gallery sectors also shifted in the last few decades, in response—or otherwise—to Institutional Critique itself? Have the locations (pre-eminently museums and exhibition spaces) that were once the objects of critique emerged in more recent generations as objects of desire, or even fetishism? Contributors: John Searle, Hans Haacke, Alexander Alberro, Maria Eichhorn, Andrea Fraser, Isabelle Graw, Martin Sastre, Renee Green, Ricardo Dominguez, Lynn Zelevansky, Monica Bonvicini, Christiane Paul, The Guerilla Girls, Juli Carson, Javier Tellez, Astrid Mania, Amy Pederson, The Yes Men, Lauri Firstenberg, Jens Hoffmann, Mike Kelley, John C. Welchman and Ricardo Dominguez. Special thanks to SoCCAS and the Woodbury University for Community Research and Design for their help in hosting this event.